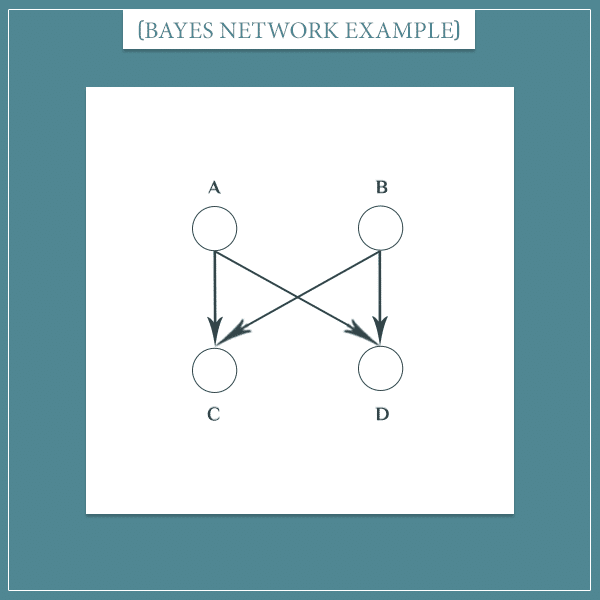 If you already feel comfortable with Bayesian networks, you shouldn’t have any problems understanding conditional dependence and independence. How can events depend on each other conditionally? Remember that Bayesian networks are all about conditional probabilities. Each node of the network has a probability distribution over its possible states. Nodes connected with arrows are dependent in the sense that information about one node changes the probability distribution of the other. There’s a simple example I keep using to illustrate conditional probabilities. If you know that there are dark clouds in the sky, the probability that it will rain will increase. And the other way around: sunny weather would make rain less likely. On the other hand, nodes not connected with arrows are independent. However, even if there is no arrow between two nodes, they can still depend on each other. This is because, as you know, information from one node can travel upwards to its parents and downwards to its children. More interesting cases arise when two nodes that were otherwise dependent become independent when there’s information about a third node’s state. The opposite can also occur and two independent nodes can become dependent, given a third node. I’m going to show how each of the two works in the rest of this section. 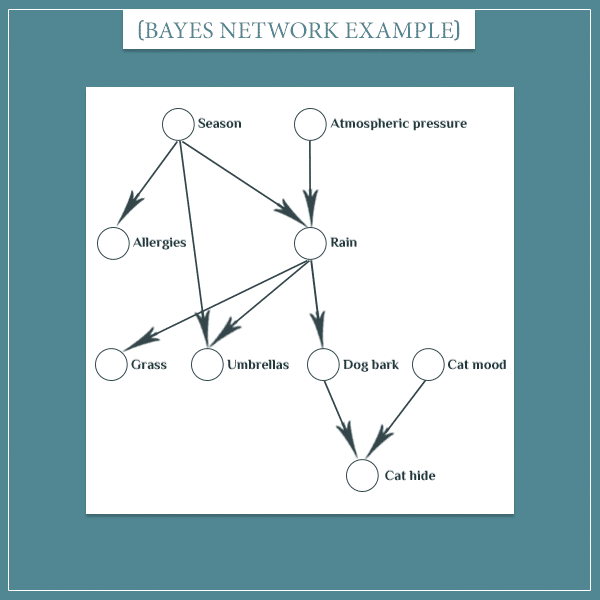 In the Bayesian network posts, I came up with an example with which I showed how information propagates within the network. Feel free to read more details about this network. For the first example of conditional independence, I’m going to take a small part of the network. As a reminder, the situation here is that there’s a dog that likes barking at the window when it’s raining outside. There’s also a cat that tends to hide under the couch when the dog is barking for any reason. Even though there’s a direct connection between the “Rain” and “Cat hide” nodes, they’re not independent. If you know that it’s currently raining, then you’ll know it’s more likely that the dog is barking. That, in turn, will make it more likely that the cat is hiding under the couch. 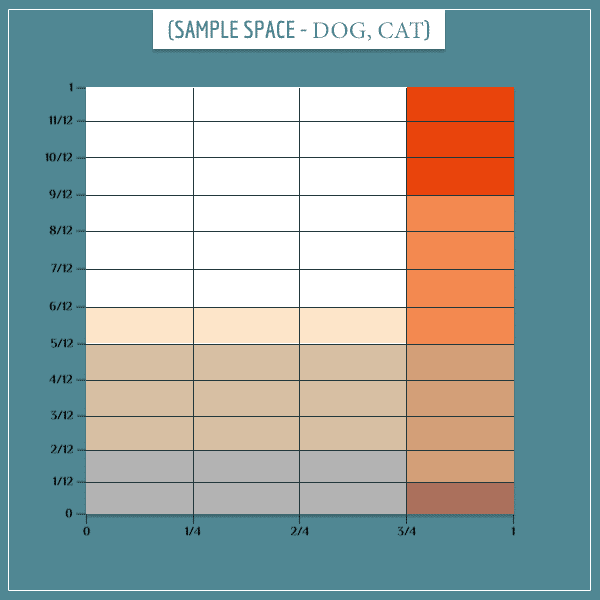 Similarly, if you know that the cat is hiding, the probability that the dog is barking will also increase. The reason is that the dog’s barking is one of the possible things that can make the cat hide. For the same reason, knowing that the dog is more likely to be barking will increase the probability that it’s currently raining. But think about what happens in the same situation if you already know the dog is barking. Will observing rain still increase the probability that the cat is hiding under the couch? The answer is no. 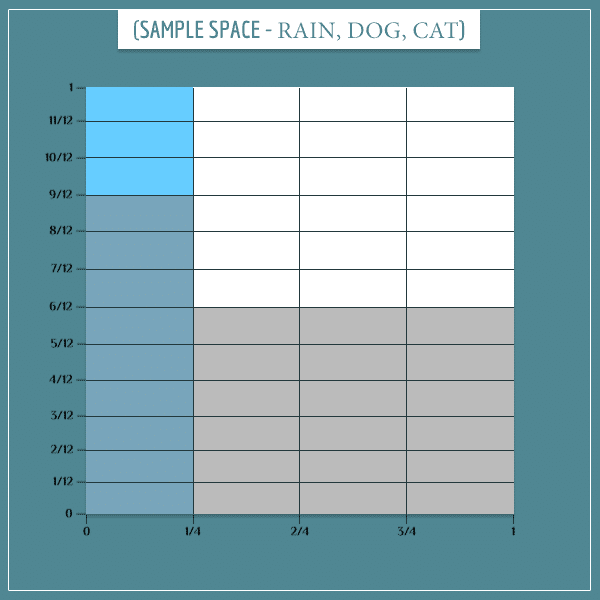 The “Rain” node was able to influence the “Cat hide” node only to the extent that it was influencing the “Dog bark” node. However, if we already know the state of “Dog bark”, this will fix its probability at 1. The consequence of the “Dog bark” node’s state being fixed is that you can no longer update it. The symbol between “Rain” and “Cat hide” means “are conditionally independent”. 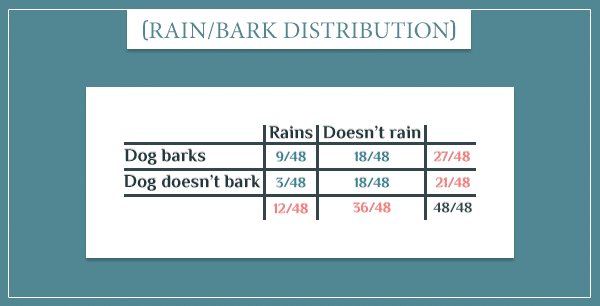 The vertical line that separates “Dog bark” is the usual notation for conditional probabilities. 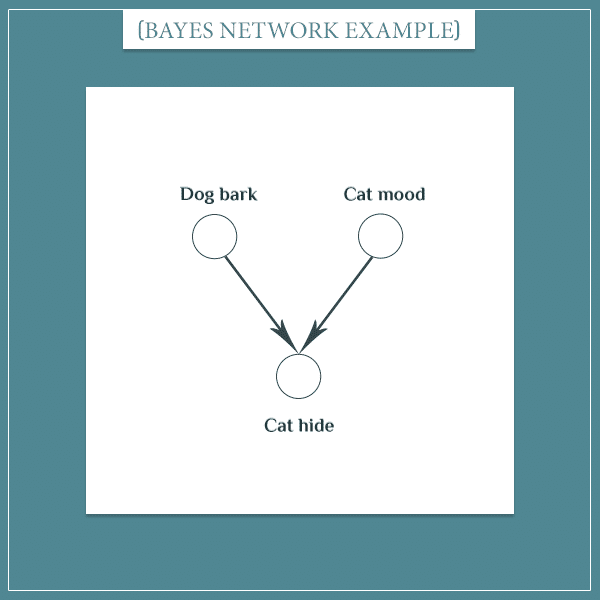 The “Rain” and “Cat hide” nodes are conditionally independent, given the “Dog bark” node. 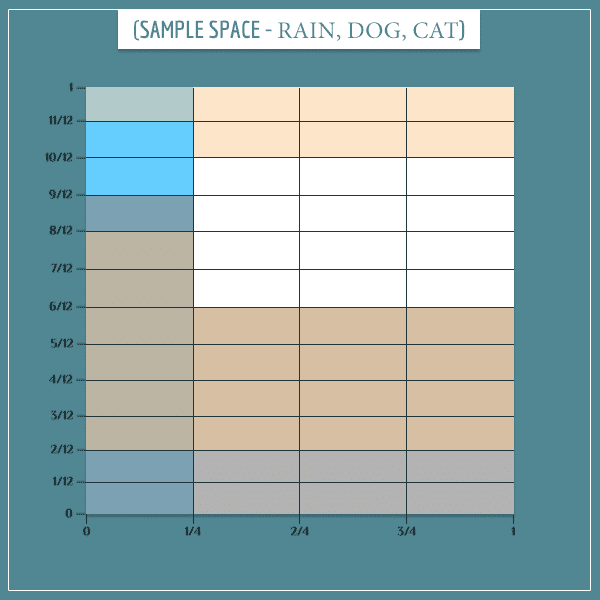 Notice how the gray rectangles are unevenly distributed over the blue and white parts of the sample space. 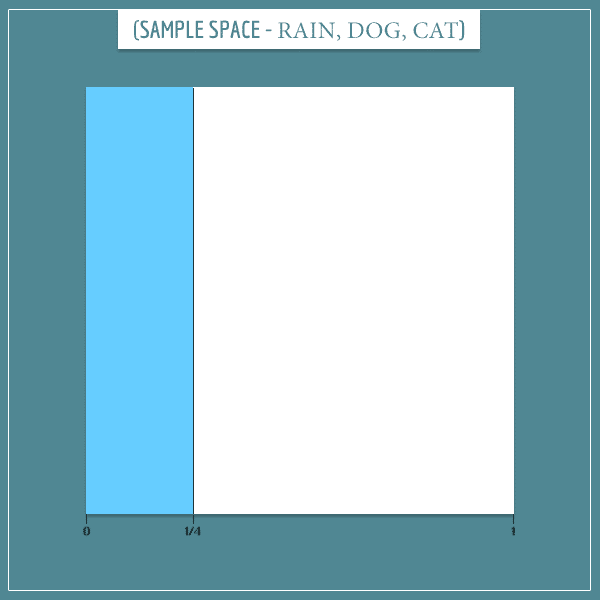 This simply captures the information that the dog is more likely to bark if it’s raining compared to if it’s not raining (compare this sample space to the first probability table above). Again, notice how the distribution of beige rectangles over the gray and white rectangles isn’t even. This captures the information that the cat is more likely to be hiding if the dog is barking. 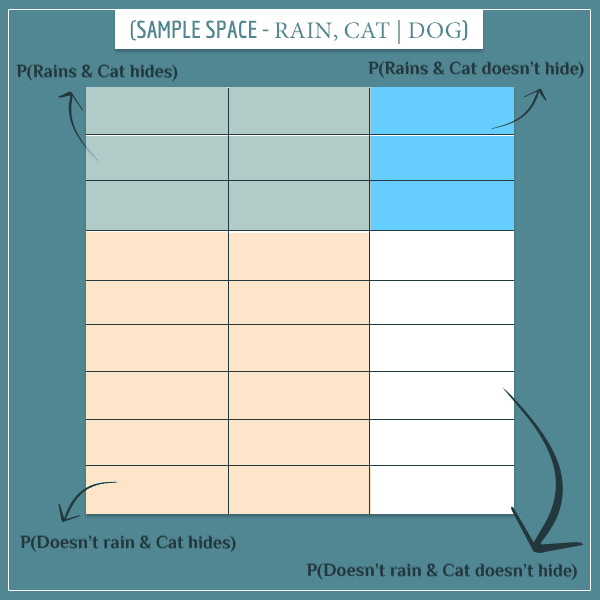 And, because the dog is more likely to be barking if it’s raining, it indirectly captures the information that the cat is also more likely to be hiding if it’s raining. The new sample space consists only of the 27 rectangles corresponding to the “Dog barks” event. Basically, the top left and top right rectangles represent the “Rains” event and the bottom left and bottom right (in white) represent the “Doesn’t rain” event. Similarly, the top left and bottom left represent the “Cat hides” event and the top right and bottom right (in white) rectangles represent the “Cat doesn’t hide” event. Notice something different here? Each colored block has the same width as the one on the same horizontal side of the sample space. And each colored block has the same height as the one on the same vertical side. This is a specific case of a more general pattern for the sample space of independent events. Well, this is precisely the definition of independent events! The marginal probability of one event equals the conditional probability of the event, given the other event. Take some time to think about this posterior sample space and why the two events became independent when they normally aren’t. 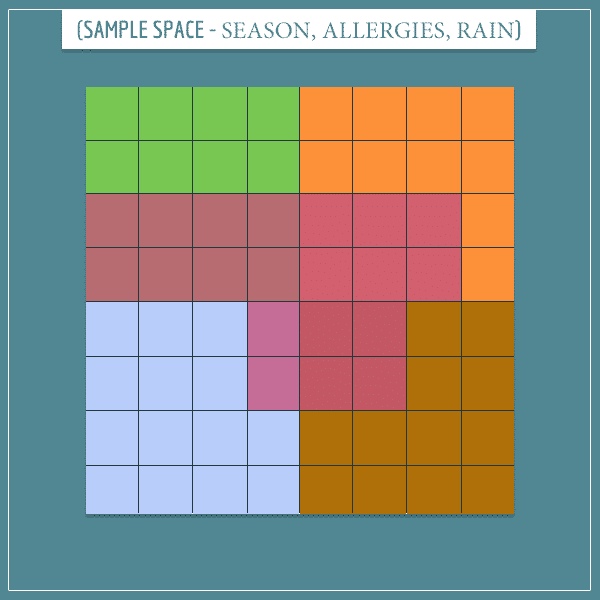 Notice how allergies (the squares colored with pinkish color) are most likely to be triggered during spring and least likely to be triggered during winter (I don’t have much expertise in allergies, but I thought this distribution would be relatively realistic). In this case, information about one of the sibling nodes will update the probability of the other, as the parent is a mediating node. For example, notice that P(Rain | Winter) = 0. This means that if it’s raining, you can exclude winter from the list of possible seasons. 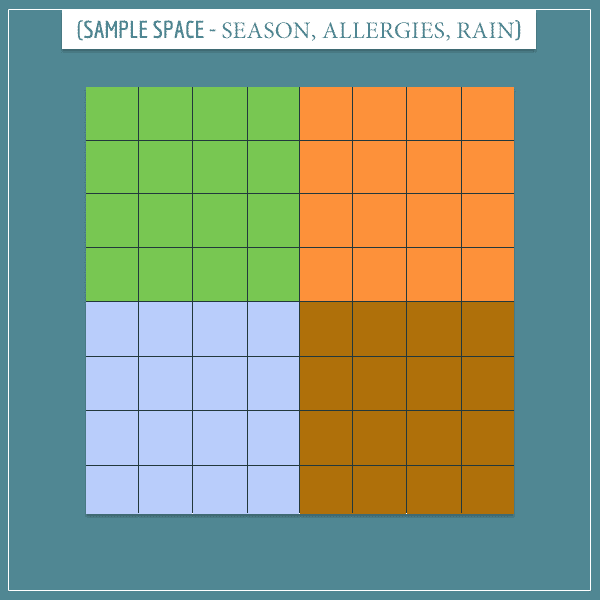 Therefore, you’re in one of the other 3 seasons during which allergies are more likely. 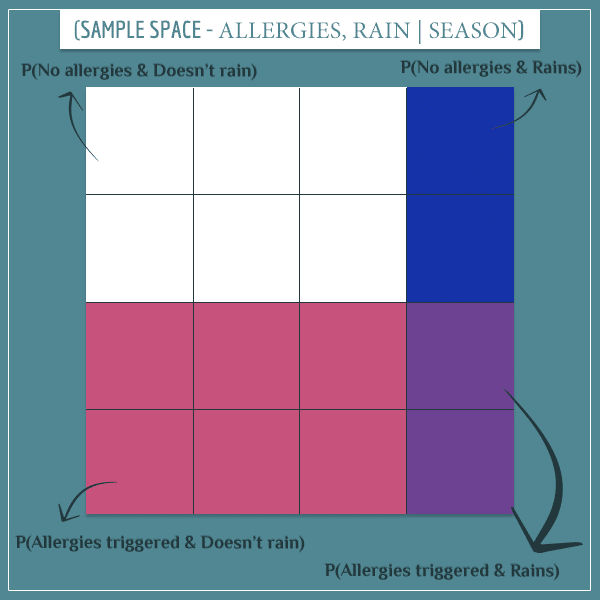 So, the information that it’s raining indirectly increases P(Allergies). But what happens when you know the “Season” node’s current state? 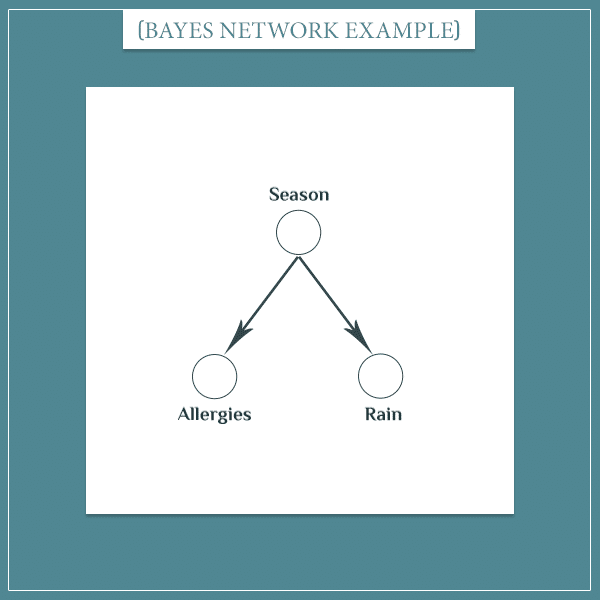 For the same reason as in the first case, this node can no longer be updated (because its state is known with certainty) and this blocks the information path between the “Allergies” and “Rain” nodes. So far, I talked about situations in which two dependent nodes can become independent. But the opposite can also happen. Here I’m assuming that the mood the cat’s in is independent of the dog’s “decision” to start barking or not. However, the cat’s “decision” to hide is dependent both on the dog’s behavior and on its current mood (stressed, relaxed, and so on). The gray rectangles represent the “Dog barks” event and the red rectangles represent the “Cat stressed” event. Maybe by now you’re able to recognize the pattern of independence I’ve been pointing at. As you can see, it’s also present here. 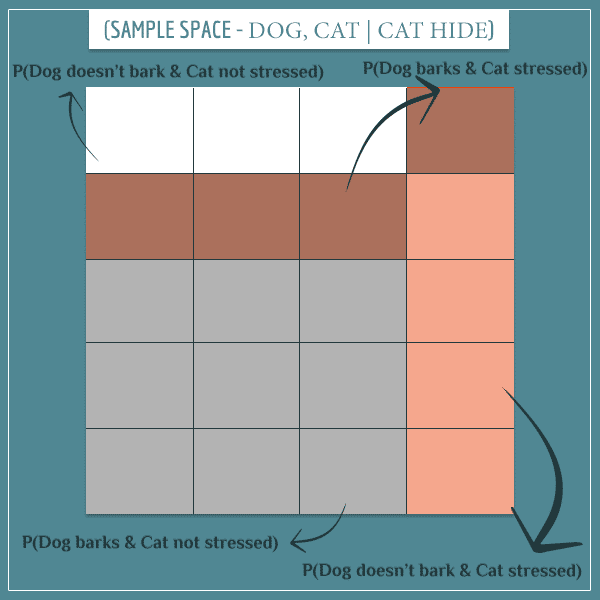 Notice how the beige rectangles (representing “Cat hides”) are disproportionately spread over the “Dog barks” and “Cat stressed” rectangles. It’s precisely this disproportionality that will make the parent nodes conditionally dependent, given their child. Which means the events are no longer independent! The intuition behind this is that both parent nodes are potential explanations of the child node, so there’s some competition between them. It’s limited because one event’s occurrence doesn’t exclude the other. It simply makes it less likely. 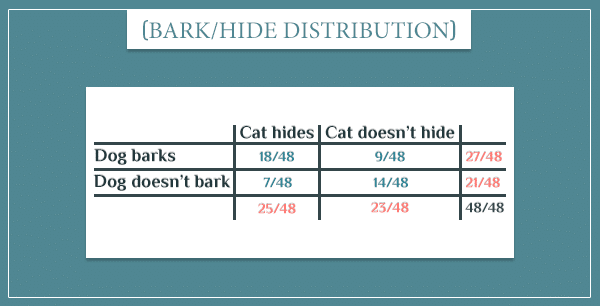 For example, P(Dog barks | Cat stressed) = 1/2, which is less than P(Dog barks) = 13/20. This phenomenon is known as explaining away because, generally, the more likely one explanation becomes, the less likely the other explanations will be, and vice versa. 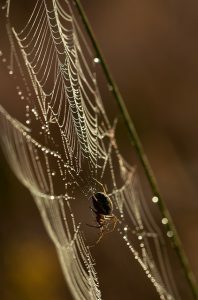 So, observing a node basically opens the information flow between its parents and they become dependent. And this is the reason to call this dependence conditional — the nodes are dependent only when one of their children is observed. However, it’s important to give the full picture of how this works in a general Bayesian network. Let’s go case by case. This network is very similar to the previous one. However, instead of a single middle node, there are now 2. By now, it should be obvious that nodes A and D are not independent. The difference between this case and the simpler case above is that observing one of the 2 middle nodes (B and C) wouldn’t be sufficient to make A and D independent. For example, observing node B would indeed block one of the paths from A to D. But information can still flow between A and D through node C and, therefore, they’re not conditionally independent, given only node B. A and D are conditionally independent, given B and C.
In the most general case, two sets of nodes are conditionally independent, given a third set of nodes, if the third set of nodes blocks all information paths between them. 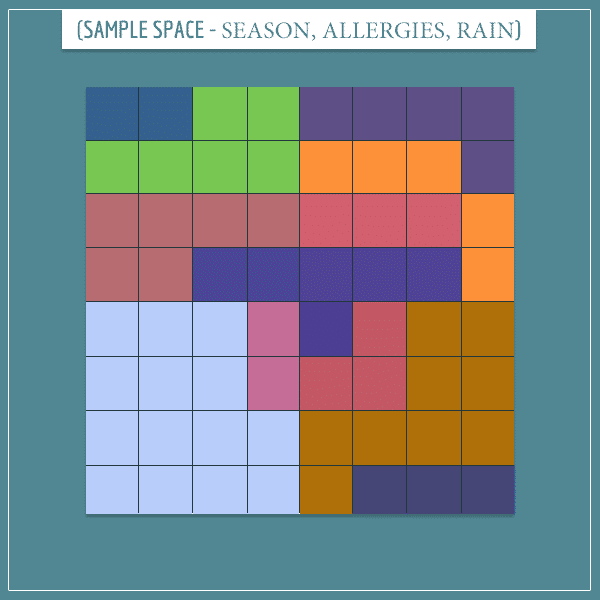 Here, the sibling nodes “Allergies” and “Rain” were able to influence each other through their common parent “Season”. But if “Season” is in a fixed state, the siblings become independent. Hence, siblings are conditionally independent, given their parents. In this case, observing one of the parents (A or B) isn’t enough because information can still flow between C and D through the other parent. This situation is analogous to the previous case and the general idea is the same. Two sets of nodes are conditionally independent, given a third set, if the third set blocks all information paths between them. Take a look at the last graph again. I gave it as an example for conditional independence, but it can also be used to illustrate the general concept of conditional dependence. When nodes C and D are unobserved, nodes A and B are independent. However, if one of the nodes is observed, it opens the information path between A and B and they’re no longer independent. In short, if two nodes have one or more children in common, it’s enough to observe either of the children for the nodes to become dependent. Hence, the more general principle can be stated in the following way: two sets of nodes are conditionally dependent, given any of their common children. In this case, if node C is not observed, nodes A and B would be independent. However, observing node D would update the probability distribution of node C, which would partially open the information flow between A and B. So, in general, two nodes are conditionally independent only if none of their common successor nodes are observed. The concept of d-separation summarizes the three general cases I described in this section. Basically, two sets of nodes are said to be d-separated from each other if there are no open information paths between them. Them being d-separated is just another way of saying that they are independent. Open information paths consist of unobserved common middle or parent nodes, as well as observed common successor nodes. D-separation is very useful because it allows you to drop non-existent dependencies from the posterior distribution. And this can greatly simplify the final expression. 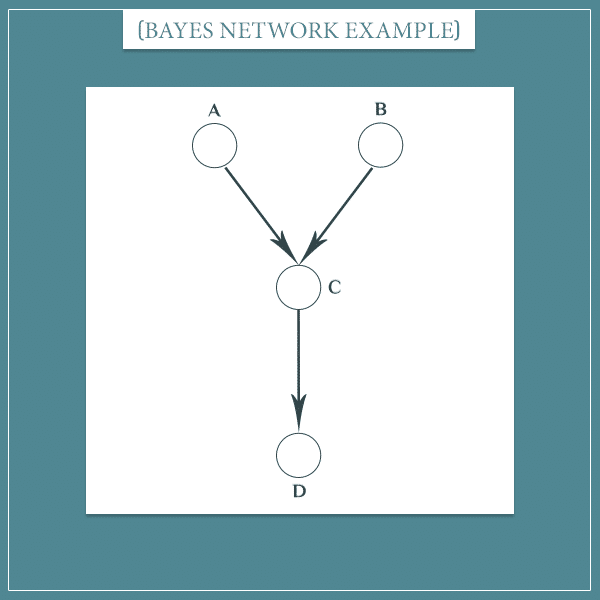 As I said in the beginning, this post is an informal Part 3, after Part 1 and Part 2, of the Bayesian belief networks series. Parents and children of middle nodes are conditionally independent, given all the middle nodes. Sibling nodes are conditionally independent, given all their common parents. Parent nodes are conditionally dependent, given any of their common successors (common children, grandchildren, and so on). 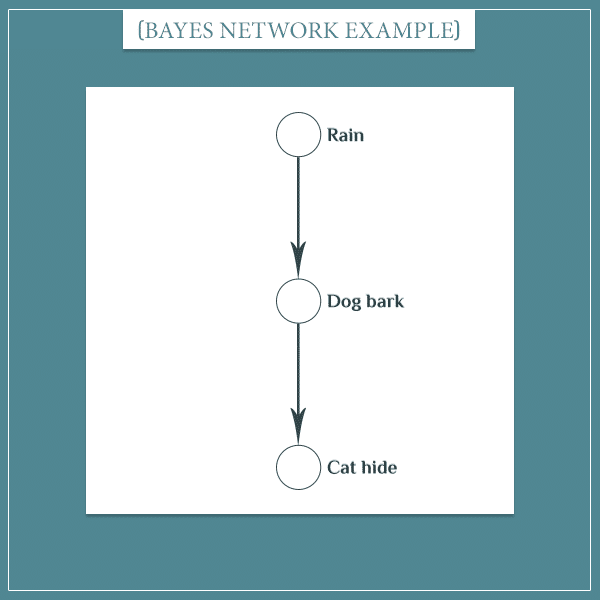 If you found this post difficult to follow, try reading the 2 Bayesian network posts I linked to in the beginning. But overall, I hope you found my explanations and examples here useful. In some of the next few posts, I plan to show a few real-world applications of Bayesian networks in which I’ll also make use of the conditional dependence/independence properties of the graphs, which should give you even better intuition about their usefulness. Thank you very much. So good. The article is awesome. It is a very well-written article. I have now gained a better understanding of what d-separation and conditional (in)dependence are. Thank you very much.